The recipe was simple: take snippets of popular records, mix in a live “reporter” asking the questions, add a few sound effects and strike quickly, while the topic (politics, flying saucers, or other current trends) is hot. Added to this genre in 1960 was a parody of that year’s presidential campaign between John F. Kennedy (portrayed here as “John Finnerty”) and Richard M. Nixon (“Nick Dixon”). 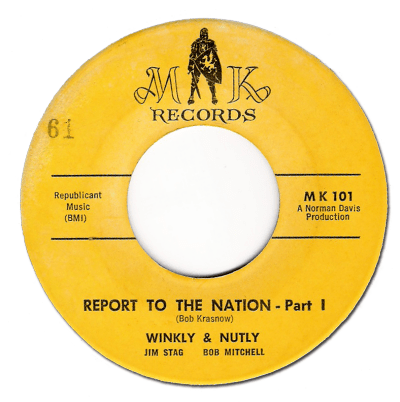 Jim Stag and Bob Mitchell conduct the pseudo-interviews as “Willie Winkly” and “Ned Nutly,” a take-off on the popular NBC-TV news anchors David Brinkley and Chet Huntley. Stag and Mitchell (air name of Michael Guerra) were linchpins in the Top 40 success of San Francisco’s 1260/KYA in the early 1960s. After KYA, Stag (born Jimmy Pearson Staggs) would go on to his greatest success at Chicago Top 40 powerhouse WCFL (“Super ’CFL”), where he was known as Jim Stagg. He left radio in 1975, and opened the chain of popular retail stores known as “Record City” in suburban Chicagoland. He passed away from complications of esophageal cancer on November 6, 2007. Mitchell, one of the great lost stars of Top 40 radio, would recruit his old Philadelphia cohort Tom “Big Daddy” Donahue to KYA before moving on to RKO General’s KHJ/Los Angeles, where he was known as Bobby Tripp. He died of leukemia in 1968. Another KYA airman, Norman Davis — known on the air at this time as “Lucky Logan” — served as producer for the record, released as “Report To The Nation,” with Part 1 on the A-side and Part 2 on the B-side of the 45-rpm vinyl single on the MK Records label. The concoction was credited as having been written by Bob Krasnow, whose curriculum vitae included stints as promoter for James Brown and with the King, Kama Sutra and Buddha record labels. (He was head of King’s San Francisco office at the time of this recording; note that the MK Records logo includes the silhouette of a knight.) Krasnow would go on to found both Loma Records (1964)and the legendary Blue Thumb Records label (1968), and later became chairman of Warner/Elektra/Asylum. 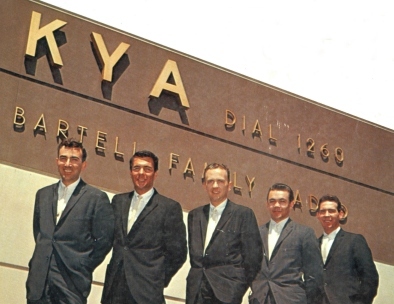 The KYA Air Staff, 1961 (l-r): Bob Mitchell, Les Crane (“Johnny Raven”), Peter Tripp, Norman Davis and Jim Stag, from the cover of the “KYA’s Golden Gate Greats” LP. Some of us KYA DJs were sitting around one day discussing all the “flying saucer” records we had heard. They were called “flying saucer” because the first ones were on a flying saucer theme, but they were all records with a narrative and short bits from several hit records. We thought we could probably put one of these together and we started suggesting song bits and questions. I liked the idea and wrote some dialogue. We decided on the bits to use and one evening after work, I recorded Stag and Mitchell. Then I spent all night in the production studio, whacking the thing together. Of course we played it at KYA and so did some other stations that got a copy. We managed to make the Variety Top 100 records list. I think we were listed at 91. Kraz had made promises as to how we would get paid something for our efforts, but we never saw a dime. He kept what he made on his own pressings, and then sold the rights to Roulette Records. I think he got $5,000. Again, we never saw a penny. The Roulette version came out, but it was a bit late and nothing much happened with it. You may also enjoy the B-side of this record individually by selecting Part II. KYA staff photo by Don Tong, courtesy of Norman Davis and RadioThrills.com.